Here is as much as was known at the time of going to press. As reported elsewhere, there are only ten teams this year as the FIA has said that Arrows does not get a start, having missed 5 Grands Prix this year. Arrows boss Tom Walkinshaw has immediately appealed, saying that if he hasn’t got a start next season, the “sale” of Arrows will fall over. In the meantime, the bailiffs are banging on the doors. Last week I mentioned that DKW, the German car and bike manufacturer, was founded by Jorgen Skafte Rasmussen. I asked what did the initials DKW stand for? Hands up all who said, “Das Kleine Wunder”? Well, you’re all wrong. The initials came from a steam car that our mate Jorgen designed called “Dampfe Kraft Wagen” in 1916. So to this week, and we may as well stick with acronyms and such. We all know that “GT” stands for “Gran Tourismo” - so when was this term first applied? Now that should give the web crawlers something to do for at least several nano-seconds! Motorcycle riders in Thailand comprise the vast majority of fatalities in this country. Perhaps I should have called them ex-motorcycle riders, as they won’t be riding again in this lifetime. Recently Chiang Mai did a survey and found that more than 50% of motorcycle riders in the North did not even have a licence! There are those cynics in our midst who would go so far as to claim that in this country you buy your licence first and then learn to drive/ride. Be that as it may, 50% of all those with a leg across a motorcycle didn’t even get that far - they have no licence at all! Now I am not claiming that the possession of a licence makes every rider immune from accidents and injury, far from it. But if the rider has had some sort of scrutiny as to their prowess, then we may have rid the roads of the terminal wobblers, more than one of which has attacked various external parts of my parked motor vehicle. And yours! However, to get these people into a driving centre and to have them properly tested, without fear or financial favour, is well beyond the scope of this little article. However, there is one thing this article can do to lower the road toll - and that is to advocate the wearing of a decent crash helmet. Note I wrote “decent”. There are helmets out there which wouldn’t pass muster to hold ice cream, let alone hold your brains from getting melted and mushy. It was the Bell helmet people many years ago that ran the brilliantly simple ad - “If you’ve got a $10 head, wear a $10 helmet.” How true! What is needed, is for the authorities to insist that retail outlets only sell helmets that meet a world standard, US Snell or whatever. But meet a recognised standard. Now I also know full well that the “better” helmets are more expensive - but please re-read the Bell helmet advertising slogan! If you are riding a 40,000 baht new bike (or even a 20,000 baht second-hand motorcycle), then you can afford the 1,000 baht for a good helmet. You just budget for it. The compulsory wearing of crash helmets in the UK and Australia lowered not only the road toll, but also the number of ‘vegetables’ that survived their motorcycle crash. And since it is compulsory for the rider to wear helmets in this country, let’s extend that to the pillion passenger(s) as well - all four of them! With a decent helmet you can actually live to tell the tale. The wearing of a good motorcycle helmet (done up), by all people on a motorcycle, would do wonders for reduction of the road toll. So where do you come in? Well, first off, wear your helmet. Secondly, make sure it is a “good” one. Thirdly, insist that your pillion passenger wears one as well - and of a decent standard too. The future’s in your hands, or should I rather say, the future’s on your head! The latest manufacturer to claim that they are making Thailand their manufacturing base is KIA Motors. KIA has had a few problems in their homeland, Korea, but have come out of the Korean auto recession and are expanding. 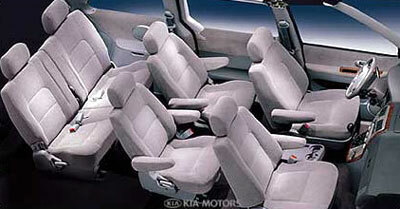 The Carnival 7-seater MPV has sold well in Thailand and KIA are talking 5,000 units a year within three years. One reason for the predicted increase in sales is the formation of Yontrakit KIA Motors which will assemble the Carnival here in Thailand. KIA are also talking about assembly of their small car line in another two years after the release of the locally produced Carnival around the middle of next year. This one is probably less likely, with KIA having just spent USD 300 million to set up the manufacture of their small sedans in China. However, bringing the MPV line on-shore makes sense, to directly face GM with the very successful Zafira. A couple of weeks back I asked about some strange vehicles that had been snapped in Thailand. Regular quiz competitor Peter Eades had this to say about this one. 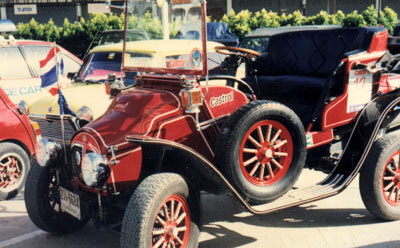 “The red car with artillery wheels that you want identified looks similar to something I owned way back in 1970. It was a Siva Edwardian Roadster designed by Neville Trickett and made from 1969 until 1976. Only 105 Sivas were made and only 25 were the Roadster model. It was based on the Ford E93A chassis and engine. So there you are, fellow Automaniacs - that’s the closest so far! The latest driver to move from CART is Christiano da Matta, this year’s CART champion. In doing this he is following in the footsteps of Villeneuve, who also won the F1 title, and Montoya, who wants to win the F1 title, if he can only get Mrs. Schumacher’s big boy to retire! “I don’t know if I am as good as Montoya or Villeneuve. We will see next year,” said da Matta. 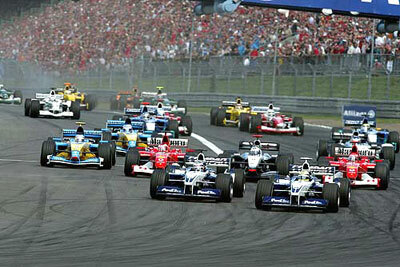 “(Michael) Schumacher is the best, as his record shows. But I’m not scared of Schumacher or anybody else. If you have the guts you have a chance. The 29-year-old Brazilian also admits that it was not financial gain that drew him to Formula One, but rather the opportunity to try his hand at something new. And hopefully excel at it. “I don’t care about the money. I’ll make less here than in America because of the prize money I was getting over there. I have a simple lifestyle. As long as I have my guitar and bicycle I have all I need. I’m happy,” da Matta said. “I’m here in Formula One because I wanted a new challenge. Winning the CART championship was one of the biggest reasons for coming over. I’ve done that. I needed to move on. Toyota have given me that opportunity. I think someone should tell our Christiano that Toyota WILL be wanting their pound of flesh. They might not share that same idea that he shouldn’t be expecting to win races! We shall see.